recompiling new custom installers for your apps. uploading your configurations to dCloud for your client’s to sync with. Startup Behavior – dCloudConsole downloads an update file at every startup, in order to determine if updates are available to itself, and also to get current version information for your dCloud apps. General Behavior – dCloudConsole downloads an update file every 10 minutes, for the purposes above; it also re-downloads your subscription data for dSupportSuite during that time so the list stays current. Visit Help Online – Takes you to this page! Check for Updates / Update Me! – This menu option changes to “Update Me!” when an update for dCloudConsole is available. Whenever you see this menu option, it is strongly recommended to update dCloudConsole! dCloudExplorer – this is a simple interface for viewing, manually downloading, or removing all of your content stored in dCloud. 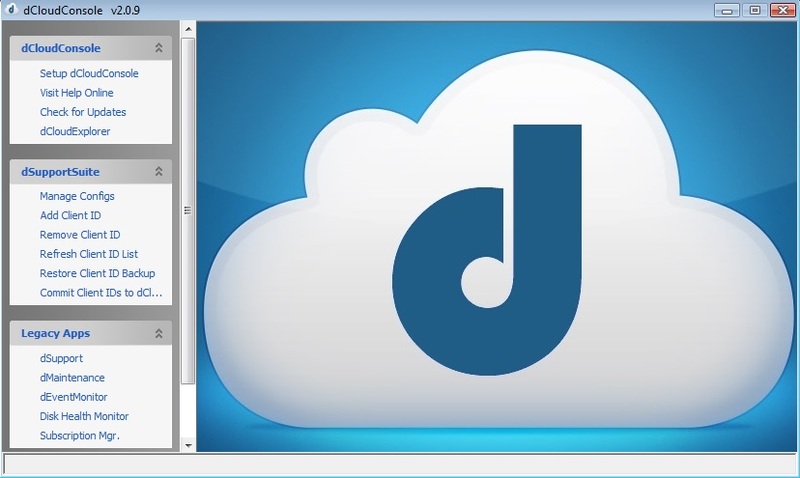 Please see the help/online manual for the app you are using with dCloudConsole for more information on how to work with dCloudConsole and that application.